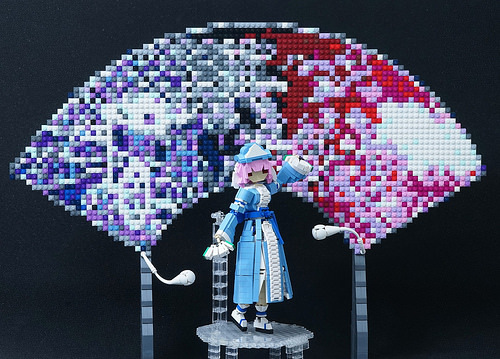 Taiwanese builder Mike Dung has a singular talent for recreating the elaborate costumes of female characters from the rich world of Far Eastern animation and videogames. But the addition of a background in his latest work is an additional treat. Despite her innocent appearance, Yuyuko is actually the final boss monster in the game Perfect Cherry Blossom from the Touhou Project series. When she casts a spell, a colorful fan appears behind her, which Mike decided to recreate as a mosaic utilizing the rich palette of LEGO hues at his disposal.